The other night we drove for hours to the heart of Apple Valley to make our annual trek up the twisted and dark roads which lead to one of SoCal’s most legendary haunts: Jordan’s High Desert Haunt (aka The Victoria Manor Haunted House). We were curious to see what Jordan and his crazy group of demonic misfits had in store for us this year since we heard there were some surprises awaiting us. This extremely unique haunt is assembled very creatively with flats, scraps, and estate sale items. This year marks the return of many of our favorite High Desert Haunt characters: the Frankenstein monster with a missing arm, Jordan’s son who jumps off various pieces of scrap metal, the Joker, the crazy doctor, and many others. Along with these classic characters are some new faces, including Pennywise and a very sinister monster who creeps around and comes at you from above your head! While in the past few years Jordan has divided his space into two separate mazes, this year there is one, big maze. New additions include a Dracula room which is decorated with Victorian furniture purchased from an estate sale. Throughout the maze there is chaos and excitement as characters come at you from every angle in the midst of constant screaming and cacophony - which we love! Tonight is an 18+ night where you might end up in the insane doctor’s chair with pancake batter all over your face. Jordan has created a strange and extraordinary world in which his desert community works together to create a Halloween event infused with intense frights and maniacal monsters. This year is the best and most extreme year yet, and we highly recommend making the trip out to Apple Valley for a night of adventure and scares in the high desert. 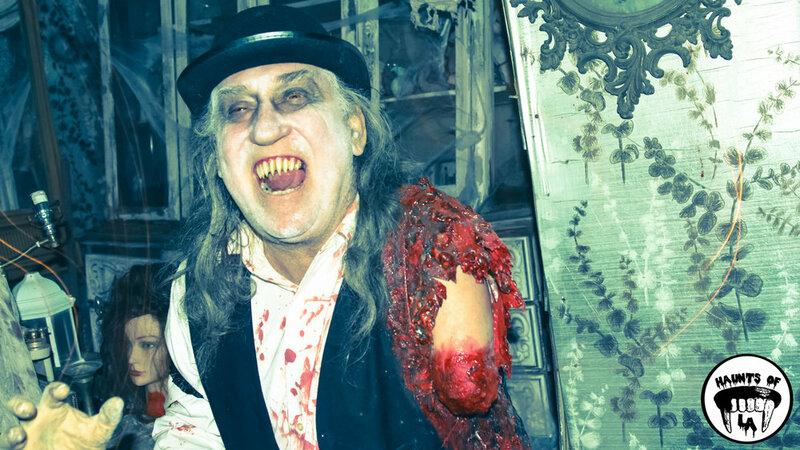 Not only will you meet Jordan and his crew of deranged monsters, but you can also visit All Saints Lunatic Asylum (@allsaintslunaticasylum) and Fear Farm Hollows (@fearfarm).